We always have lots going on! Check back periodically to learn about our fundraisers and service projects. – Grant and Service Requests are due April 15th, 2018. To learn more click here. – We are now accepting new member applications through April 15th, 2018. To learn more click here. 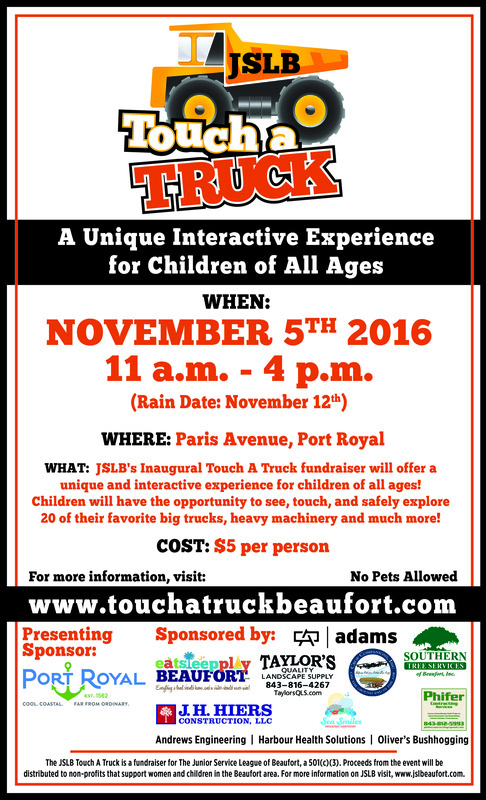 Junior Service League of Beaufort’s 2nd Annual Touch a Truck Event- November 18th, 2017. To download this press release please click here. 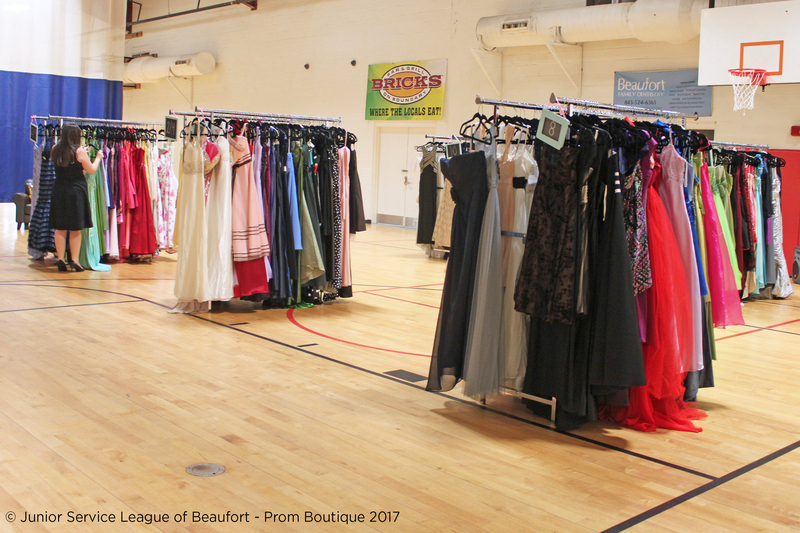 Beaufort, South Carolina – March 12, 2017 – The Junior Service League of Beaufort (JSLB) hosted its sixth annual Prom Boutique yesterday (Saturday, March 11th) from 11 a.m. to 4 p.m. at YMCA of Beaufort. They ladies of Junior Service League rolled out the red carpet for the young ladies of Beaufort County today. Members hosted 30 V.I.P. attendees for a specialty hour where they were given first choice on racks upon racks of beautiful dresses. Each young lady left with her very own special dress, jewelry and accessories, as well as makeup, nail polish, and a choice of either a free hair styling session for the night of prom or a bra from Kalon and Company. The hair styling sessions were donated from Bangs Salon, Cirque 1838 Salon, and HairPlay Salon & Color Bar. The bra was courtesy of Kalon and Company. Both were totally FREE. The event then opened up to any junior or senior in Beaufort, Jasper or Hampton counties for their own Cinderella moment. Another 45 ladies attended and nearly all left with beautifully colored, shimmery dresses. “We are so excited to continually grow this every year. This year we had more deserving young ladies during our V.I.P. hour and we’ve given away more dresses than ever. 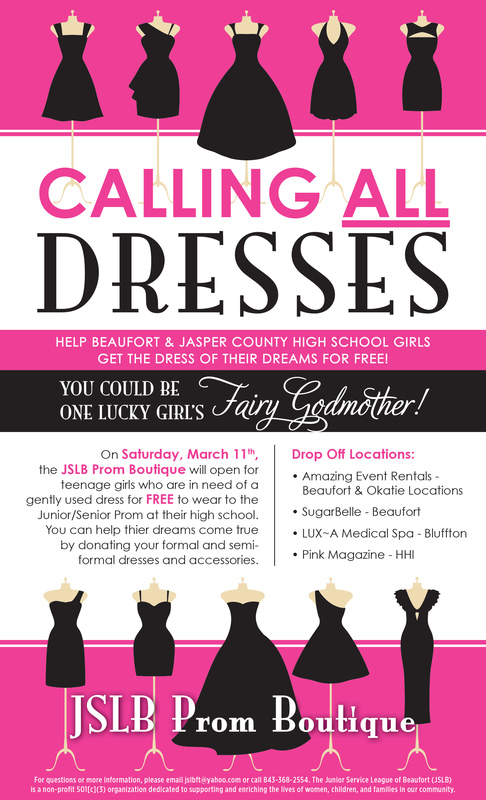 Due to the gracious donations of the ladies of Beaufort county, our dress collection has grown so we could extend this opportunity to young ladies in Hampton County and reach further than ever.” –Missy Nelson, JSLB Prom Boutique Co-chairwoman. Since 2011, JSLB’s Prom Boutique has helped girls in Beaufort and Jasper counties experience the magic of finding the perfect prom dress. In past years, over 60 girls have attended the event where they are able to choose from a wide variety of new and gently used formal dresses, accessories and jewelry at no cost. JSLB members serve as personal stylists for the girls, helping each to pick the perfect gown and complete her look. And this year, JSLB is excited to expand the opportunity to Hampton country students as well. “The event is so emotional. It feels amazing to see the reaction of the girls as they finally find the perfect dress. 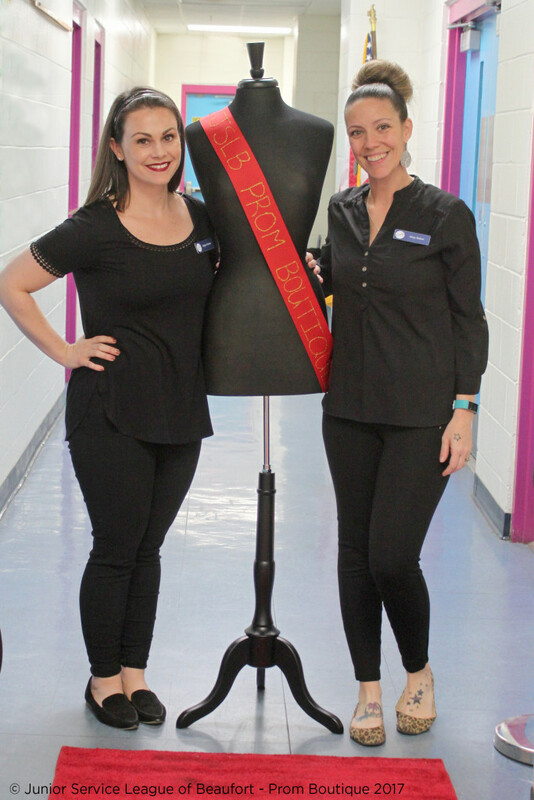 Our JSLB members—their personal stylists hand-picking dresses with the girls that fit their personality and style,” said Meghan Meehan, co-chairwoman of the Prom Boutique. JSLB is a nonprofit organization founded in 2005 dedicated to supporting and enriching the lives of women, children and families in the Beaufort County community. Since its founding, the league has donated more than $125,000 and provides regular volunteers to organizations such as the Child Abuse Prevention Association and Citizens Opposed to Domestic Abuse. JSLB also hosts an annual blood drive in the winter, a free prom dress boutique in the spring along with an annual fundraising event. For more information, please visit www.jslbeaufort.com. 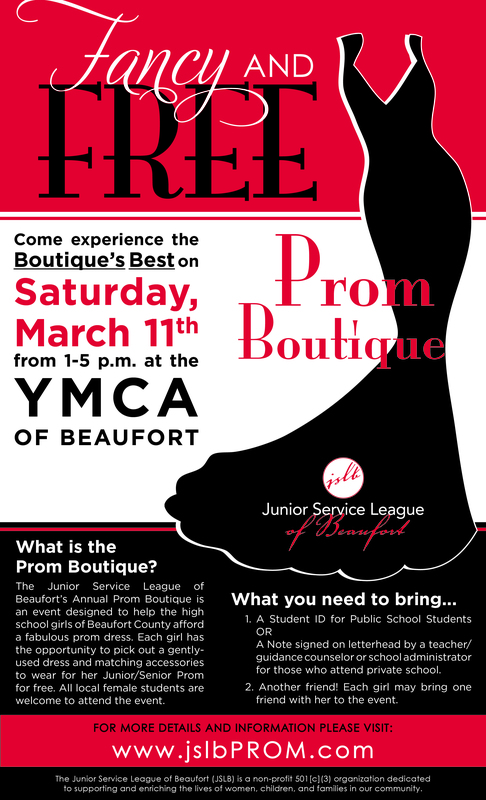 Beaufort, South Carolina – February 7, 2016 – The Junior Service League of Beaufort (JSLB) is hosting its sixth annual Prom Boutique on March 11th from 1 to 5 p.m. at YMCA of Beaufort. Since 2011, JSLB’s Prom Boutique has helped girls in Beaufort and Jasper counties experience the magic of finding the perfect prom dress. In past years, over 75 girls have attended the event where they are able to choose from a wide variety of new and gently used formal dresses, accessories and jewelry at no cost. JSLB members serve as personal stylists for the girls, helping each to pick the perfect gown and complete her look. And this year, JSLB is excited to expand the opportunity to Hampton country students as well. Similar to years past, the Prom Boutique offers attendees a red-carpet experience and includes a VIP hour, from 11 a.m. to noon for those who pre-register for the event. VIP attendees have the opportunity to have first pick of all dresses and accessories, while enjoying even more personalized attention from JSLB’s personal stylists. VIP applications are available through school guidance counselors and on the website at www.jslbeaufort.com. Any student in Beaufort, Jasper or Hampton County is invited to attend the boutique. Shoppers must show their student ID or have a letter on school letterhead from their guidance counselor, teacher or school administrator. All girls who attend the event are welcome to bring family members or friends to help them shop. The YMCA of Beaufort is located at 1801 Richmond Avenue, Port Royal, SC 29935. Members of the media are invited to attend and cover the event. An event information media sheet will be available and members will be available for comment. 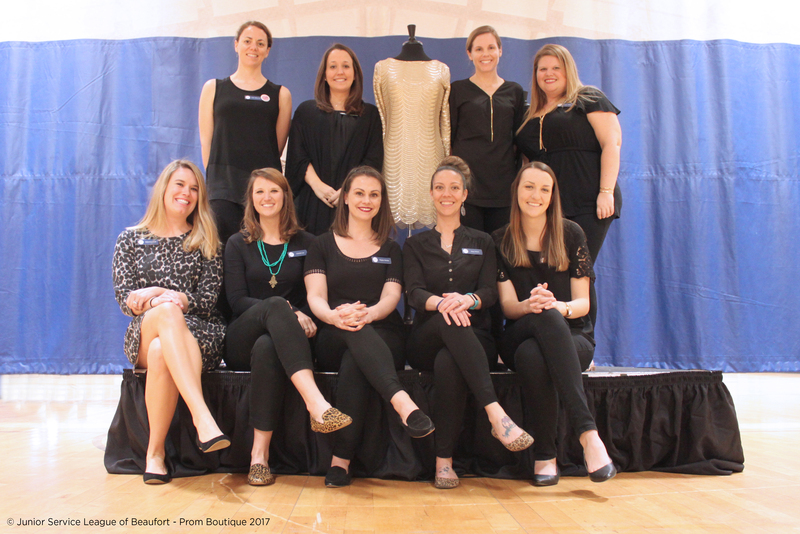 Beaufort, South Carolina – February 7, 2016 – Have a formal or party dress hanging in the back of your closet? Consider donating it to the Junior Service League of Beaufort’s Prom Boutique. The Junior Service League of Beaufort will hold its sixth annual Prom Boutique from 1 to 5 p.m. March 11th at the YMCA of Beaufort at 1801 Richmond Avenue in Port Royal. The Prom Boutique allows Beaufort, Jasper and Hampton county students to shop for and select the perfect dress, jewelry and accessories for prom at no cost to them. Dresses and accessories are needed for the event. JSLB will accept new or gently­ used long and short dresses in all sizes and accessories, such as earrings, necklaces, bracelets, shawls and handbags. Dresses must be clean and have no visible tears or stains. “This year we are particularly in need of dresses size 16 and up. We want to make sure every girl walks out feeling like Cinderella!” says co-chairwoman Meghan Meehan. Donations will be accepted until March 6th. JSLB is a nonprofit organization founded in 2005 dedicated to supporting and enriching the lives of women, children and families in our community. The league has donated more than $125,000 to area nonprofits since its founding, and league members regularly volunteer at organizations such as Child Abuse Prevention Association and Citizens Opposed to Domestic Abuse. For more information, please visit http://www.JSLBeaufort.com, email publicity.jslb@gmail.com or find us on Facebook at www.facebook.com/JSLBFT. A Unique and Interactive Experience for Children of All Ages! 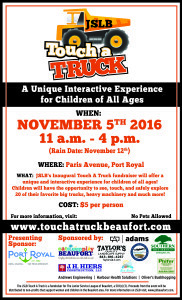 Beaufort, South Carolina – October 25, 2016 – The Junior Service League of Beaufort (JSLB) will host its inaugural Touch A Truck fundraiser on Saturday, November 5th, 2016 in Downtown Port Royal from 11 a.m. to 4 p.m. on Paris Avenue. Cost of admission is $5 per person. What is Touch A Truck? Touch A Truck is a family event that offers a unique and interactive experience for children of all ages. Children will have the opportunity to see, touch, and safely explore their favorite vehicles that serve our community. Our event will feature twenty different types of equipment to explore, including a fire truck, ambulance, bobcat, and backhoe! The entertainment area will include a variety of activities including face painting, bounce-houses for kids and much more. And to round out the experience, enjoy music and fabulous food, drinks, and libations available for purchase. Tons of fun for the whole family! “We are so excited to offer a brand new type of fundraiser to the Beaufort area! Supporting and enriching the lives of women, children, and families is our focus in all endeavors, and we think that this new fundraiser perfectly matches that mission—fun for all ages in a family-friendly environment. And even better—proceeds will all be directed right back into our community through our non-profit grants distributed in May. It’s a win for all involved!” said JSLB President and Touch A Truck Chairwoman Courtney Dukes. • In the case of rain, the event will be postponed to November 12th, 2016. • Pets will not be allowed at the event. Touch A Truck is sponsored by: Town of Port Royal, Eat Sleep Play Beaufort, Taylor’s Quality Landscaping, J.H. Hiers Construction, Adam’s Outdoor Advertising, Crop Companies, Phifer Contracting, Seasmiles Pediatric Dentistry, Andrews Engineering, Harbour Health Solutions, Oliver’s Bushhogging and more! JSLB is a nonprofit organization founded in 2005 dedicated to supporting and enriching the lives of women, children and families in the Beaufort County community. Since its founding, the league has donated more than $125,000 and provides regular volunteers to organizations such as the Child Abuse Prevention Association and Citizens Opposed to Domestic Abuse. JSLB also hosts an annual blood drive in the winter, a free prom dress boutique in the spring along with a spring and fall annual fundraising event. For more information, please visit www.jslbeaufort.com. For additional information about Touch A Truck or Junior Service League of Beaufort please contact publicity chair Lindsay Gifford at jslb.publicity@gmail.com, or visit jslbeaufort.com. This Halloween We Want Your Blood! 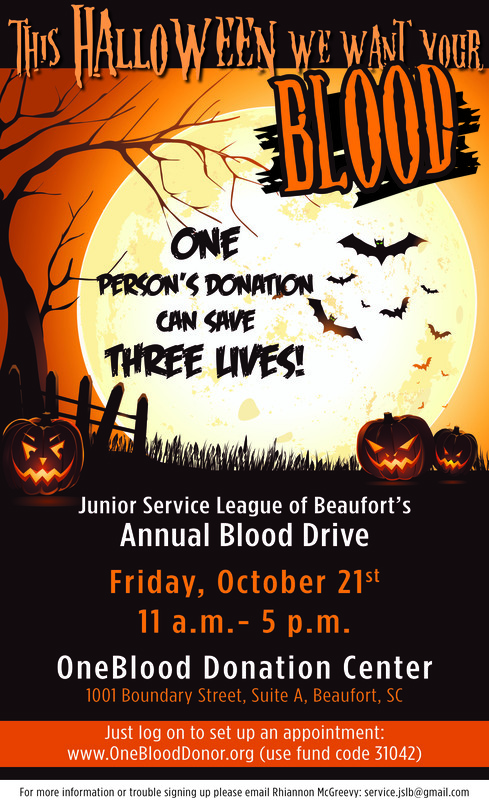 Beaufort, South Carolina – October 13, 2016 – The Junior Service League of Beaufort (JSLB) is hosting its annual blood drive on Friday, October 21st, 2016 at OneBlood Donation Center from 11 a.m. to 5 p.m. at 1001 Boundary Street, Beaufort, SC. Appointments can be made online at oneblood.org with login code 31042. The Junior Service League of Beaufort encourages all eligible persons in the area to participate. All blood donations will stay local and help our very own community. Especially in the wake of our recent disaster with Hurricane Matthew, the donation center is in critical need of blood. Why Donate? Every pint of blood donated can help save up to three lives. What better gift to give than life? The Junior Service League of Beaufort’s annual blood drive helps sustain the donation quotas required to support our community, therefore it is imperative that everyone come out and support the drive. 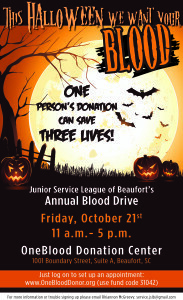 For additional information on the blood drive or Junior Service League of Beaufort please contact publicity chair Lindsay Gifford at jslb.publicity@gmail.com, or visit jslbeaufort.com.